Ten years ago, Tzahali, the first pre army preparatory Academy for religious women was opened by the YHC. It is named in memory of Tamar Ariel, the first religious woman combat navigator. 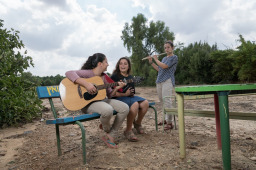 Every week, hundreds of adults and young people – religious, traditional and secular, from both urban and rural communities – converge on the Yaacov Herzog Center, located at Kibbutz Ein Tzurim on the southern coastal plane, to study together collaborative and open atmosphere that honors the various traditions and cultures of each and every person. From the Herzog Center, participants venture out into Israeli society, sounding the unique voice of Israel’s southern periphery: through the act of study they become part of the chain of generations in Jewish interpretation; and the interpersonal connections between them enrich the public discourse, turning them into purveyors of a responsive and open Jewish-Israeli culture.